Fire Red Empress was formed from the shards of several UK and French bands in 2014. Live festival appearances have included Bloodstock, Summer Breeze (in 2015) and most recently the SOS Festival in Manchester and Hard Rock Hell in November 2017. Jennifer Diehl became the band's new singer in 2016 when work commenced on recording their sophomore album, 'Black Morphine', at Hansen Studios in Ribe, Denmark with renowned producer Jacob Hansen (Volbeat). The current line-up is completed by Carl and Paul Gethin (guitars), Ben Picken (bass) and Luke Middleton (drums). 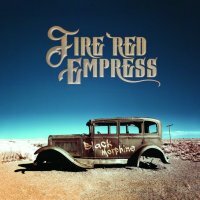 The Fire Red Empress sound relies heavily on big guitar riffs and a thunderous rhythm section, all topped off by Diehl's powerful vocals. I've seen their music listed under the "Stoner" category, but to my ears there is more of a straight-ahead Classic Rock sound involved (on this release anyway). The album contains ten full-length songs, and if I'm honest, it took a few spins for the material to resonate. Listening to the album at home my attention wandered too easily, but having played it again a few more times in the car with fewer distractions (aside from the road and other motorists obviously), the impact levels increased. The first half of the album contains the more in-your-face tracks with 'Giants', 'Half Bird Half Beetle Half Man', 'Hail The Face' and 'Black Morphine' all worthy of mention. They have greater tempo, containing riffs with more urgency and Diehl's wail has a more caustic edge and is consequently more effective and dramatic. Several songs run to a six minute length and have some neat arrangements to maintain interest levels. Brief acoustic interludes and passages of subtlety contrast nicely with the dominant incendiary music and forceful vocals, and the hooks are less than generic which is probably why I found the songs to have less identity on the first few plays. With only a digital copy of at my disposal, I'm unable to say who writes the music and lyrics, but I'm assuming the songs are all "in house" compositions. I found Hansen's mix to be a bit hit and miss with some of the music and instrumentation having greater clarity in some songs, but that is just a small quibble. Overall, it's a thumbs up, and I'd be interested to catch the band in a live setting where I'm sure the songs will take on a more electrifying lease of life.